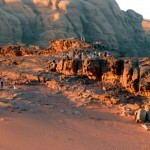 At the end of the day, enjoy the sunset over the red mountains and enjoy the hospitality of the Bedouin in one of the many camps in the reserve. 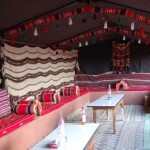 Eat a traditional meal of Zarb – meat and vegetables cooked under the sand, then sleep under the magnificent starry night sky. 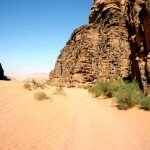 The RSCN are constantly working to protect this area, with Oryx and Ibex release programmes (in conjunction with the Shawarmi Reserve breeding centre), constantly encourage visitors to follow the rules and regulations of the reserve to minimise the impact of tourism on the site and enlisting the help of the local Bedouin by creating incomes from the benefits of sustainable tourism. 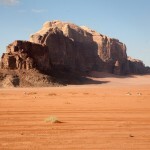 There are no hotels in Wadi Rum, but an overnight stay in a Bedouin camp is highly recommended. 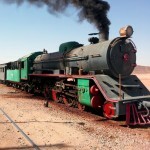 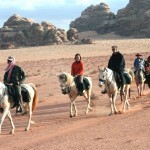 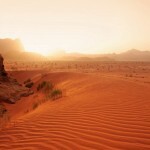 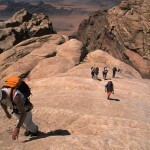 If taking part in a trekking or horse riding tour you may choose to camp out in the desert. 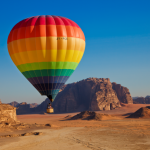 But if you prefer the comforts, Wadi Rum is possible as a day trip from Aqaba where there are a range of 3, 4 and 5 star hotels.